SEROFLO Rotacaps is a combination of fluticasone propionate, a synthetic corticosteroid, and salmeterol, a selective, long-acting beta2-agonist. Fluticasone propionate is a synthetic, trifluorinated glucocorticoid with potent anti-inflammatory activity. Salmeterol is a selective long-acting beta2-adrenoceptor agonist with duration of action of at least 12 hours. Since SEROFLO Rotacaps contain both fluticasone propionate and salmeterol, the mechanism of action described below for the individual components apply to SEROFLO Rotacaps. These drugs represent two classes of medications (a synthetic corticosteroid and a selective, long-acting beta2-adrenergic receptor agonist) that have different effects on the clinical, physiologic, and inflammatory indices of asthma. Fluticasone propionate is a synthetic, trifluorinated corticosteroid with potent anti-inflammatory activity. In vitro assays using cytosol preparations from human lungs have established fluticasone propionate as a human glucocorticoid receptor agonist with an affinity eighteen times greater than dexamethasone, almost twice that of beclomethasone-17-monopropionate (BMP), the active metabolite of beclomethasone dipropionate, and over three times that of budesonide. Data from the McKenzie vasoconstrictor assay in humans are consistent with these results. Inflammation is an important component in the pathogenesis of asthma. Corticosteroids have been shown to inhibit multiple cell types (e.g., mast cells, eosinophils, basophils, lymphocytes, macrophages, and neutrophils) and mediator production or secretion (e.g., histamine, eicosanoids, leukotrienes, and cytokines) involved in the asthmatic response. These anti-inflammatory actions of corticosteroids contribute to their efficacy in asthma. Salmeterol is a long-acting beta2-adrenergic agonist. In vitro studies and in vivo pharmacologic studies demonstrate that salmeterol is selective for beta2-adrenoceptors compared with isoproterenol, which has approximately equal agonist activity on beta1- and beta2-adrenoceptors. In vitro studies show salmeterol to be at least fifty times more selective for beta2-adrenoceptors than salbutamol. Although beta2-adrenoceptors are the predominant adrenergic receptors in bronchial smooth muscle and beta1-adrenoceptors are the predominant receptors in the heart, there are also beta2-adrenoceptors in the human heart, comprising 10–50% of the total beta-adrenoceptors. The precise function of these receptors has not been established, but their presence raises the possibility that even selective beta2-agonists may have cardiac effects. The pharmacologic effects of beta2-adrenoceptor agonist drugs, including salmeterol, are at least in part attributable to stimulation of intracellular adenyl cyclase, the enzyme that catalyses the conversion of adenosine triphosphate (ATP) to cyclic-3', 5'-adenosine monophosphate (cyclic AMP). Increased cyclic AMP levels cause relaxation of bronchial smooth muscle and inhibition of release of mediators of immediate hypersensitivity from cells, especially from mast cells. Salmeterol contains a long side chain, which binds to the exo-site of the receptor. These pharmacological properties of salmeterol offer more effective protection against histamine-induced bronchoconstriction and produce a longer duration of bronchodilation, lasting for at least 12 hours, than recommended doses of conventional short-acting beta2 agonists. In humans, salmeterol inhibits the early and late phase response to inhaled allergen; the latter persisting for over 30 hours after a single dose when the bronchodilator effect is no longer evident. Single dosing with salmeterol attenuates bronchial hyper-responsiveness. These properties indicate that salmeterol has additional non-bronchodilator activity, but the full clinical significance is not yet clear. In vitro tests show that salmeterol is a potent and long-lasting inhibitor of the release of mast cell mediators, such as histamine, leukotrienes, and prostaglandin D2, from human lungs. Salmeterol inhibits histamine-induced plasma protein extravasation and inhibits platelet activating factor-induced eosinophil accumulation in the lungs of guinea pigs when administered by the inhaled route. In humans, single doses of salmeterol administered via inhalation aerosol attenuate allergen-induced bronchial hyper-responsiveness. Salmeterol has been studied in the treatment of conditions associated with chronic obstructive pulmonary disease (COPD) and has been shown to improve symptoms, pulmonary function, and quality of life. Peak steady-state fluticasone propionate plasma concentrations in adult patients with asthma (N = 11) ranged from undetectable to 266 pg/mL after a 500-mcg twice-daily dose of fluticasone propionate inhalation powder. The mean fluticasone propionate plasma concentration was 110 pg/mL. Because of the small therapeutic dose, systemic levels of salmeterol are low or undetectable after inhalation of recommended doses (50 mcg of salmeterol inhalation powder twice daily). Following chronic administration of an inhaled dose of 50 mcg of salmeterol inhalation powder twice daily, salmeterol was detected in plasma within 5 to 45 minutes in 7 patients with asthma; plasma concentrations were very low, with mean peak concentrations of 167 pg/mL at 20 minutes and no accumulation with repeated doses. The total clearance of fluticasone propionate is high (average, 1,093 mL/min), with renal clearance accounting for less than 0.02% of the total. The only circulating metabolite detected in man is the 17(beta)-carboxylic acid derivative of fluticasone propionate, which is formed through the CYP 3A4 pathway. This metabolite had less affinity (approximately 1/2,000) than the parent drug for the glucocorticoid receptor of human lung cytosol in vitro and negligible pharmacological activity in animal studies. Other metabolites detected in vitro using cultured human hepatoma cells have not been detected in man. An in vitro study using human liver microsomes showed that salmeterol is extensively metabolized to (alpha)-hydroxysalmeterol (aliphatic oxidation) by CYP 3A4. Ketoconazole, a strong inhibitor of CYP 3A4, essentially completely inhibited the formation of (alpha)-hydroxysalmeterol in vitro. Following intravenous dosing, fluticasone propionate showed polyexponential kinetics and had a terminal elimination half-life of approximately 7.8 hours. Less than 5% of a radiolabeled oral dose was excreted in the urine as metabolites, with the remainder excreted in the feces as parent drug and metabolites. Terminal half-life estimates of fluticasone propionate is 5.6 hours. The xinafoate moiety has no apparent pharmacologic activity. The xinafoate moiety is highly protein bound (>99%) and has a long elimination half-life of 11 days. No terminal half-life estimates were calculated for salmeterol following administration of SFC dry powder inhaler. 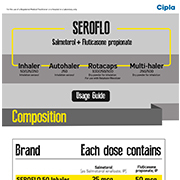 SEROFLO Rotacaps are indicated in the regular treatment of asthma, where use of a combination (long-acting beta2-agonist and inhaled corticosteroid) has been found to be appropriate, and in patients with severe chronic obstructive pulmonary disease (COPD). SEROFLO Rotacaps should only be inhaled with the Cipla Rotahaler/Revolizer device. SEROFLO Rotacaps must not be swallowed. SEROFLO Rotacaps are contraindicated in patients with a history of hypersensitivity to any of the component of the drug product. The use of SEROFLO Rotacaps is contraindicated in primary treatment of status asthmaticus or other acute episodes of asthma or COPD where intensive measures are required. Also contradicted in patients with severe hypersensitivity to milk proteins. Patients should be made aware that SEROFLO Rotacaps must be used daily for optimum benefit, even when asymptomatic. SEROFLO Rotacaps should not be initiated in patients during rapidly deteriorating or potentially life-threatening episodes of asthma. SEROFLO Rotacaps should not be used for transferring patients from systemic corticosteroid therapy. SEROFLO Rotacaps should not be used to treat acute asthma symptoms for which a fast and short acting bronchodilator is required. Patients should be advised to have their medicinal product to be used for relief in an acute asthma attack available at all times. Increased requirements for use of reliever medication (short-acting bronchodilators), or decreased response to reliever medication indicate deterioration of control and patients should be reviewed by a physician. Patients should not be initiated on SEROFLO Rotacaps during an exacerbation, or if they have significantly worsening or acutely deteriorating asthma. Serious asthma-related adverse events and exacerbations may occur during treatment with SEROFLO Rotacaps. Patients should be asked to continue treatment but to seek medical advice if asthma symptoms remain uncontrolled or worsen after initiation on SEROLFO Rotacaps. Treatment with SEROFLO Rotacaps should not be stopped abruptly in patients with asthma due to risk of exacerbation. Therapy should be down-titrated under physician supervision. For patients with COPD cessation of therapy may also be associated with symptomatic decompensation and should be supervised by a physician. Rarely, SEROFLO Rotacaps may cause cardiac arrhythmias e.g. supraventricular tachycardia, extrasystoles and atrial fibrillation, and a mild transient reduction in serum potassium at high therapeutic doses. Therefore SEROFLO Rotacaps should be used with caution in patients with severe cardiovascular disorders, heart rhythm abnormalities, diabetes mellitus, thyrotoxicosis, uncorrected hypokalaemia or patients predisposed to low levels of serum potassium. Potentially serious hypokalaemia may result from systemic beta2-agonist therapy, but following inhalation at therapeutic doses, plasma levels of salmeterol are very low. There have been very rare reports of increases in blood glucose levels and this should be considered when prescribing to patients with a history of diabetes mellitus. As with other inhalation therapy paradoxical bronchospasm may occur with an immediate increase in wheezing after dosing. SEROFLO Rotacaps should be discontinued immediately, the patient assessed and alternative therapy instituted if necessary. Care should be taken when transferring patients to SEROFLO Rotacaps therapy, particularly if there is any reason to suppose that adrenal function is impaired from previous systemic steroid therapy. Systemic effects may occur with any inhaled corticosteroid, particularly at high doses prescribed for long periods. These effects are much less likely to occur than with oral corticosteroids. Possible systemic effects include Cushing's syndrome, Cushingoid features, adrenal suppression, growth retardation in children and adolescents, decrease in bone mineral density, cataract and glaucoma. It is important, therefore, that the patient is reviewed regularly and the dose of inhaled corticosteroid is reduced to the lowest dose at which effective control of asthma is maintained. Prolonged treatment of patients with high doses of inhaled corticosteroids may result in adrenal suppression and acute adrenal crisis. Children and adolescents <16 years taking high doses of fluticasone (typically > 1000mcg/day) may be at particular risk. Very rare cases of adrenal suppression and acute adrenal crisis have also been described with doses of fluticasone propionate between 500 and less than 1000 mcg. Situations, which could potentially trigger acute adrenal crisis, include trauma, surgery, infection or any rapid reduction in dosage. Presenting symptoms are typically vague and may include anorexia, abdominal pain, weight loss, tiredness, headache, nausea, vomiting, hypotension, decreased level of consciousness, hypoglycaemia, and seizures. Additional systemic corticosteroid cover should be considered during periods of stress or elective surgery. It is recommended that the height of children receiving prolonged treatment with inhaled corticosteroid is regularly monitored. The dose of inhaled corticosteroid should be reduced to the lowest dose at which effective control of asthma is maintained. The benefits of inhaled fluticasone propionate therapy should minimize the need for oral steroids, but patients transferring from oral steroids may remain at risk of impaired adrenal reserve for a considerable time. Patients who have required high dose emergency corticosteroid therapy in the past may also be at risk. This possibility of residual impairment should always be borne in mind in emergency and elective situations likely to produce stress, and appropriate corticosteroid treatment must be considered. The extent of the adrenal impairment may require specialist advice before elective procedures. There was an increased reporting of lower respiratory tract infections (particularly pneumonia and bronchitis) in a 3 year study in patients with Chronic Obstructive Pulmonary Disease (COPD) receiving salmeterol/fluticasone compared with placebo. In a 3 year COPD study, older patients, patients with a lower body mass index (< 25kg/m2) and patients with very severe disease (FEV1<30% predicted) were at greatest risk of developing pneumonia regardless of treatment. Physicians should remain vigilant for the possible development of pneumonia and other lower respiratory tract infections in patients with COPD as the clinical features of such infections and exacerbation frequently overlap. If a patient with severe COPD has experienced pneumonia the treatment with SEROFLO Rotacaps should be re-evaluated. Immediate hypersensitivity reactions may occur after administration of SEROFLO Rotacaps, as demonstrated by cases of urticaria, angioedema, rash, and bronchospasm. In rare cases, patients on inhaled fluticasone propionate, may present with systemic eosinophilic conditions. Physicians should be alert to eosinophilia, vasculitic rash, worsening pulmonary symptoms, cardiac complications, and/or neuropathy presenting in their patients. SEROFLO Rotacaps, like all medications containing sympathomimetic amines, should be used with caution in patients with convulsive disorders or thyrotoxicosis and in those who are unusually responsive to sympathomimetic amines. The pharmacological side effects of beta2 agonist treatment, such as tremor, palpitations and headache, have been reported, but tend to be transient and reduce with regular therapy. Studies have shown that LABA’s such as salmeterol increase the risk of asthma-related death. Even though plasma levels of salmeterol and fluticasone are very low, potential interactions with other substrates or inhibitors of CYP 3A4 cannot be excluded. Both non-selective and selective beta-blockers should be avoided in patients with asthma, unless there are compelling reasons for their use. Concomitant use of other beta-adrenergic containing drugs can have a potentially additive effect. SEROFLO Rotacaps should be administered with extreme caution to patients being treated with monoamine oxidase inhibitors or tricyclic antidepressants, or within 2 weeks of discontinuation of such agents, because the action of salmeterol on the vascular system may be potentiated by these agents. Fluticasone propionate and salmeterol, the individual components of SEROFLO Rotacaps, are substrates of CYP3A4. The use of strong CYP3A4 inhibitors (e.g., ritonavir, atazanavir, clarithromycin, indinavir, itraconazole, nefazodone, nelfinavir, saquinavir, ketoconazole, telithromycin) with SEROFLO Rotacaps is not recommended because increased systemic corticosteroid and increased cardiovascular adverse effects may occur. In a small study in healthy volunteers, the slightly less potent CYP3A inhibitor ketoconazole increased the exposure of fluticasone propionate after a single inhalation by 150%. This resulted in a greater reduction of plasma cortisol as compared with fluticasone propionate alone. Co-administration of ketoconazole (400 mg orally once daily) and salmeterol (50 micrograms inhaled twice daily) in 15 healthy subjects for 7 days resulted in a significant increase in plasma salmeterol exposure (1.4-fold Cmax and 15-fold AUC). This may lead to an increase in the incidence of other systemic effects of salmeterol treatment (e.g. prolongation of QTc interval and palpitations) compared with salmeterol or ketoconazole treatment alone. Clinically significant effects were not seen on blood pressure, heart rate, blood glucose and blood potassium levels. Co-administration with ketoconazole did not increase the elimination half-life of salmeterol or increase salmeterol accumulation with repeat dosing. Co-treatment with other potent CYP3A inhibitors, such as itraconazole, telithromycin are also expected to increase the systemic fluticasone propionate exposure and the risk of systemic side-effects. Caution is recommended and long-term treatment with such drugs should if possible be avoided. Ritonavir can greatly increase the concentration of fluticasone propionate in plasma. Therefore, concomitant use should be avoided, unless the potential benefit to the patient outweighs the risk of systemic corticosteroid side-effects. There is also an increased risk of systemic side effects when combining fluticasone propionate with other potent CYP3A inhibitors. Co-administration of moderate CYP 3A4 inhibitors such as erythromycin (500mg orally three times a day) and salmeterol (50 micrograms inhaled twice daily) in 15 healthy subjects for 6 days resulted in a small but non-statistically significant increase in salmeterol exposure (1.4-fold Cmax and 1.2-fold AUC). Co-administration with erythromycin was not associated with any serious adverse effects. The ECG changes and/or hypokalemia that may result from the administration of nonpotassium-sparing diuretics (such as loop or thiazide diuretics) can be acutely worsened by beta-agonists such as salmeterol, when the recommended dose of the beta-agonist is exceeded. Pharmacokinetic studies using salmeterol/fluticasone have not been conducted to examine differences in patients with renal impairment. Pharmacokinetic studies using salmeterol/fluticasone have not been conducted to examine differences in patients with hepatic impairment. However, since both fluticasone propionate and salmeterol are predominantly cleared by hepatic metabolism, impairment of liver function may lead to accumulation of fluticasone propionate and salmeterol in plasma. Therefore, patients with hepatic impairment should be closely monitored. There are insufficient data on the use of salmeterol and fluticasone propionate during pregnancy and lactation in man to assess the possible harmful effects. Administration of SEROFLO Rotacaps to pregnant women should only be considered if the expected benefit to the mother is greater than any possible risk to the foetus. The lowest effective dose of fluticasone propionate needed to maintain adequate asthma control should be used in the treatment of pregnant women. There are no data available for human breast milk. Both salmeterol and fluticasone propionate are excreted into breast milk in rats. Administration of SEROFLO Rotacaps to women who are breastfeeding should only be considered if the expected benefit to the mother is greater than any possible risk to the child. Caution should be exercised when SEROFLO Rotacaps is administered to a nursing women. As SEROFLO Rotacaps contains salmeterol and fluticasone propionate, the type and severity of side effects associated with each of the compounds may be expected. There is no incidence of additional side effects following concurrent administration of the two compounds. behavioural changes(predominantly in children); cushing's syndrome; cushingoid features; hypokalemia; hyperglycaemia; headache; dental discomfort and pain; candidiasis mouth/throat; hyposalivation; gastrointestinal infections; disorders of the hard tissue of teeth; haemorrhoids; gastrointestinal gaseous symptoms; abdominal discomfort and pain; constipation; oral abnormalities; arthralgia and articular rheumatism; muscle cramps and spasms; musculoskeletal inflammation; bone and skeletal pain; sleep disorders; migraines; allergies and allergic reactions; viral infections; bacterial infections; candidiasis unspecified site; congestion; inflammation; bacterial reproductive infections. Lower respiratory signs and symptoms, lower respiratory infections, lower respiratory haemorrhage, eczema, dermatitis, and dermatosis, and urinary infections can occur. Rare cases of immediate and delayed hypersensitivity reactions, including rash and other rare events of angio-oedema and bronchospasm, have been reported. Other side effects include pneumonia; sinusitis; bronchitis; hypokalemia; xerostomia; contusions; myalgia; traumatic fractures; pallor; lymphatic signs and symptoms; muscle injuries; fractures; hematomas; ear signs and symptoms; nasal signs and symptoms; nasal sinus disorders; keratitis and conjunctivitis; oral ulcerations; oral discomfort and pain; lower respiratory signs and symptoms; pneumonia; muscle stiffness, tightness, and rigidity; bone and cartilage disorders; compressed nerve syndromes; chest symptoms; fluid retention; unusual taste; viral skin infections; skin flakiness and acquired ichthyosis; disorders of sweat and sebum; cataracts and glaucoma. The signs and symptoms of salmeterol overdose are tremor, headache and tachycardia. The preferred antidotes are cardioselective beta-blocking agents, which should be used with caution in patients with a history of bronchospasm. If SEROFLO Rotacaps therapy has to be withdrawn due to overdose of the beta agonist component of the drug, provision of appropriate replacement steroid therapy should be considered. Additionally, hypokalaemia can occur and potassium replacement should be considered. Prolonged treatment of patients with high doses of inhaled corticosteroids may result in adrenal suppression and acute adrenal crisis. Monitoring of adrenal reserve may be necessary. In cases of fluticasone propionate overdose SEROFLO Rotacaps therapy may still be continued at a suitable dosage for symptom control.